No one comes to Miami to stay indoors. Whether you’re into dancing, sunset views or a laid back vibe, Miami is full of amazing bars and restaurants with even better tasting drinks. Take advantage of the perfect weather almost year round and visit these trendy & hip spots. Below is our top 10 list of places to grab a drink in Miami. 18 floors up and infinitely chic, The 1 Rooftop at 1Hotel South Beach sports 360-degree views of azure ocean and glimmering downtown skyline. Plush white couches, reclaimed wood tables, and sky-blue bar stools mingle with the green of swaying palm fronds. East, Miami, a hotel that crowns downtown Miami’s billion-dollar Brickell City Centre complex, is home to Sugar. Forty floors up, Sugar has a bit of a wild side with its jungle-themed decor, and the menu reflects more of the same. Expect Asian-style tapas and cocktails like the Lychee Blossom, a mix of vodka, sake, and lychee, and a lineup of beertails. The space also hosts regular tasting events, like a five-course sake lab. There’s no shortage of bars to catch the sunset on the west side of Miami Beach. But only one combines that sunset with a swanky poolside party, the all-white opulence of the Mondrian, and expertly designed furniture for you to relax and enjoy the colors over the skyline. If Epcot had a “Cuba World,” the bar there would look exactly like Ball & Chain. Except this place is real. An odd historic spot in Miami that hasn’t been bulldozed for condos, this Calle Ocho club saw the likes of Billie Holiday, Duke Ellington, and Louie Armstrong, as the posters from its heyday that now line the walls will attest. Restored and reopened last year, the main room with vaulted Dade County pine ceilings leads to a tropical oasis of a backyard, complete with a bandshell shaped like a pineapple. Look down and you’ll see the Miami River meet Biscayne Bay; look up and you’ll come face to face with a collection of downtown’s towering skyscrapers. There are also some great happy hour deals during the week, including a “Chase the Clock” deal on Friday nights from 5–midnight (where the cost of your cocktail matches the hour hand on the lock, i.e. $5 at 5 p.m., $6 at 6 p.m., etc.). Escape to a backyard oasis and revel in the Tales of Cocktail’s award-winning Best American Hotel Bar. The Broken Shaker’s handcrafted cocktails are composed of elixirs, syrups and infusions made from garden herbs and spice, and fresh-pressed produce and exotic ingredients from around the world. 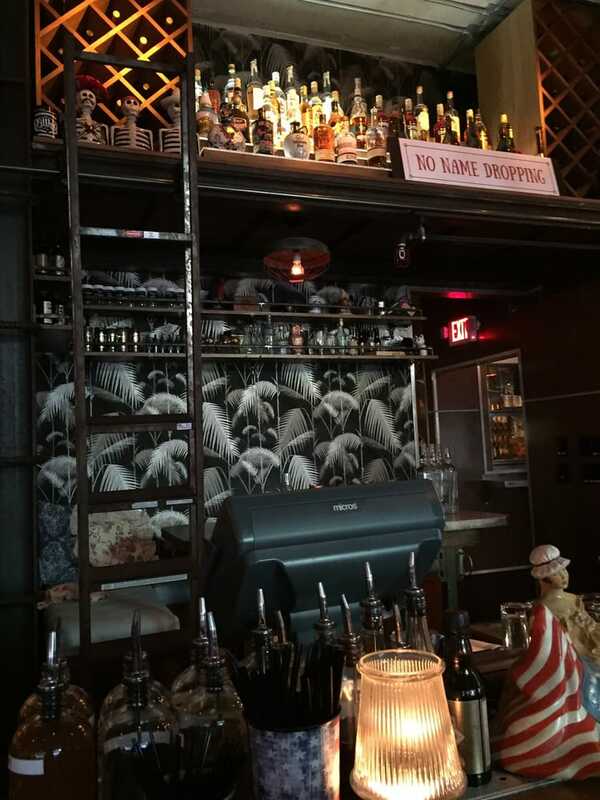 A popular drinking spot in Miami, Sweet Liberty is a fun spot for when you’re not up to the whole Miami club vibe or shwanky rooftop scene. It’s got a great list of cocktails and has oysters for under a dollar from 4pm to 7pm. Smack in the middle of South Beach’s famed Art Deco District, Highbar—the ’70s-inspired rooftop pool lounge at the Dream South Beach—offers views of the Atlantic and local landmarks like the former Versace Mansion, which abuts the Dream on the ocean side. Turn your back on it all for the poolside cocktails and freshly made guacamole or watermelon and queso fresco salad courtesy of Naked Taco Miami. Also, they throw some bangin’ pool parties with great DJs. While it doesn’t sit atop the Fontainebleau itself, La Côte—a bilevel beach club and restaurant that evokes the French Riviera—has its own rooftop lounge space that adds a bit of intimacy to the iconic (and rather imposing) hotel. With views of both the pool and the ocean, it offers some prime people-watching, and is a great spot for thirsty groups: La Côte’s signature drinks are available by the pitcher.